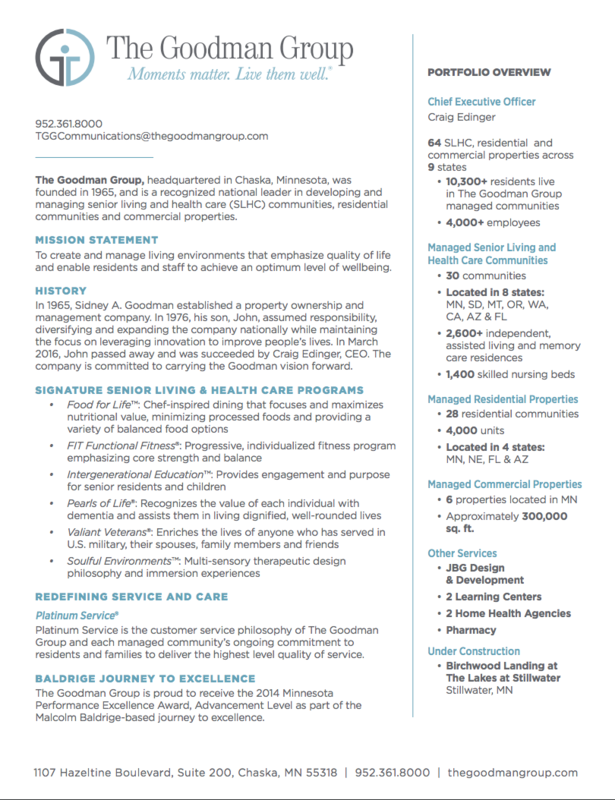 MINNEAPOLIS, Minn. (Oct. 20, 2016) – Global Health & Pharma’s 2016 Healthcare and Pharmaceutical Awards have named The Goodman Group “Best for Senior Living Management Support – USA.” The awards seek to chronical the individuals, departments and organizations, both corporate and public, that work tirelessly throughout the industry. They are given solely on merit and are awarded to commend those most deserving for their ingenuity and hard work, proving them worthy of recognition. To learn more about our award winners and to gain insight into the working practices of the “best of the best” in the health and pharma industries, please visit (http://www.ghp-magazine.com/) where you can access the winners supplement. The Goodman Group in the News.